Hi, my name is Melpomene, and I am a pop addict. And my most recent earworm is a chipper, confidant, swaggering number by the rising British pop singer Meghan Trainor, “All About That Bass”. It explores the omnipulchritude of all people, reaffirming the age old concern over the beauty of cures and confidence. It is absurd. And delightful. And listening to it during one fateful grading session, I was struck with an inspiration: this song would make a great Teacher Anthem. So I made the thing. I (and my sweet teacher friend Katey) parodied the lyrics, and now we give you, “All About Those As”. Turn on the video, and scroll down to read the lyrics with the music. You know I won’t be too easy, don’t even bother to cry. But if that’s what you’re into then just go ahead and try. Go ahead and tell the common core that. Every one of you’s engaged from the back row to the front. But if that’s what you’re into please just go ahead and try. My teacher friends and I want to make a video of this, but we are unsure of how. Does anyone have recommendations on how to make a video? The Egotist’s Club Turns Three! We are ancient. At least in blog years. But it has been a good three years. We have laughed, we have cried, we have rhapsodized, and we have slacked off. Unfortunately, the pressure of being an adult in an adult world seems to sap our cognitive and scribbling strength. But we have been doing better lately, haven’t we? 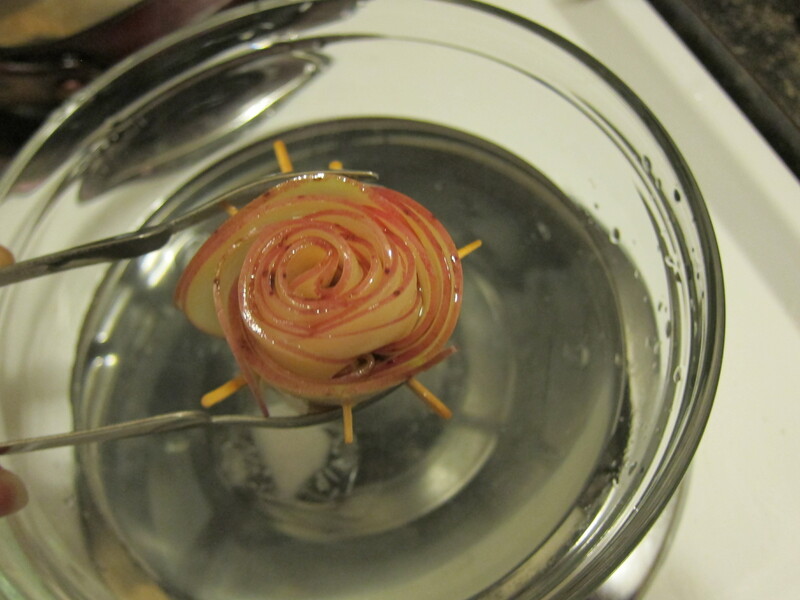 It was an eccentric, but delightful partnership between Thalia and myself that began this blog. (The story is related here.) It was in part as a challenge to practice writing (haha) and in part as an outlet for snark and craziness. We have matured and grown in wisdom since then, moving onto grander flights of fancy and deeper plunges into melancholy than ever before. 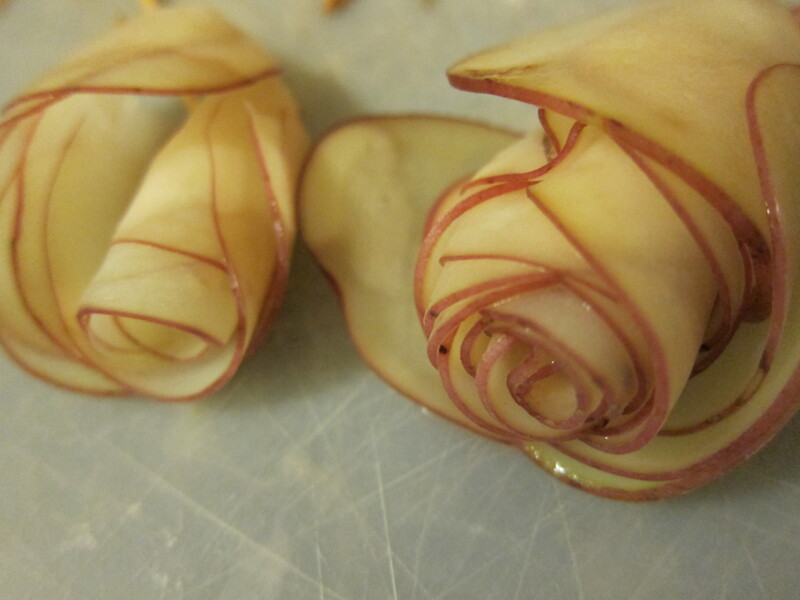 Sometimes we chose to share these with you, and sometimes we did not. Consider that to be both a blessing and a curse. There is not enough giddy joy and absurdity in the world. Well, there probably is, but it takes special eyes to see it. Thalia and I started this Club with the idea of training ourselves to look for that angle of wonder and adventure, but somewhere along the way it seems to have gotten slightly lost. So, as a round-about way of getting back, I present . . . . AWESOMENESS! 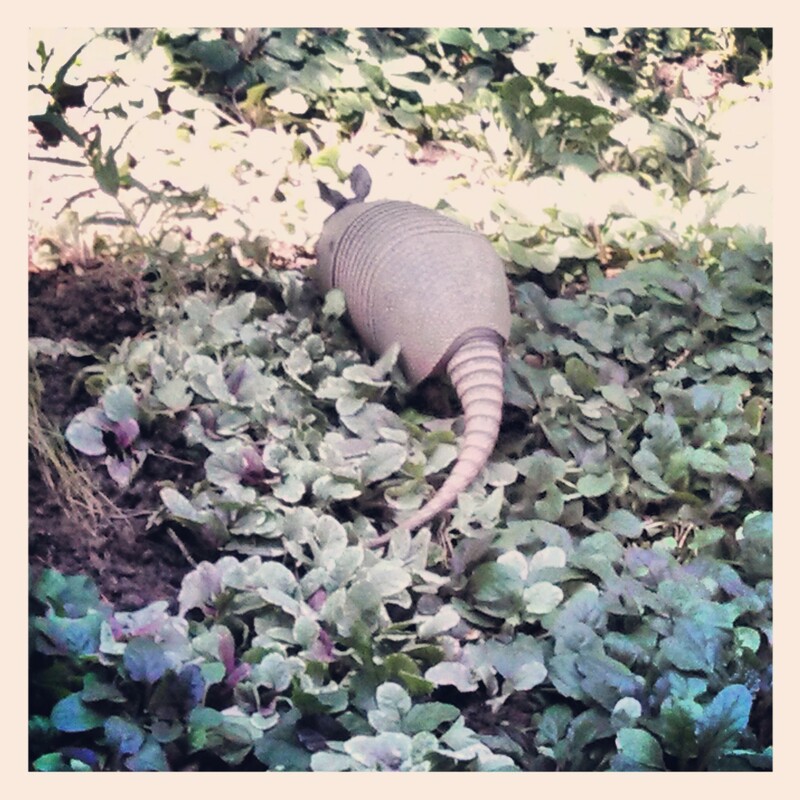 Here are a few of the awesome things that I have seen or observed, online or in real life, in the past few weeks. Last week I set my requirements for a personal library. I forgot to mention a slide. Can you slide AND read a book? Storm clouds are exhilarating. 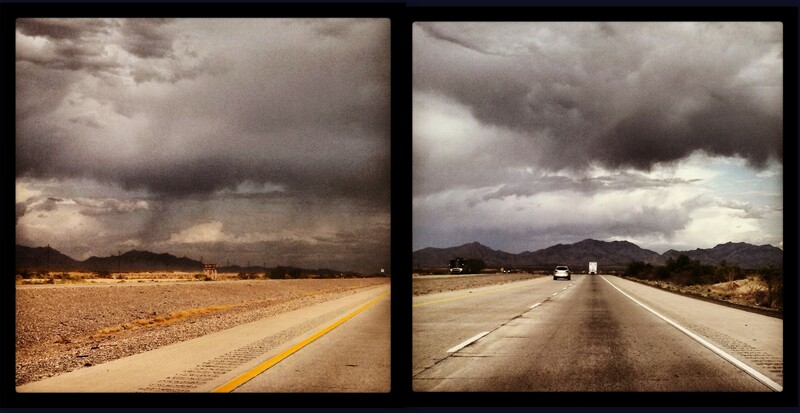 There is nothing like racing a thunders storm across the desert towards mountains. Clouds are really strange and fascinating. Grocery store cashiers can be pretty darling. They might be the new bar tenders psychologists, in a really short-and-sweet way. Have you ever found yourself moaning about something in brief to the cashier, and he or she moans with you and then encourages with a simple “You’ll be all right, sweetie!” as they hand you your bags and send you out the door? Oddly, I never see that same cashier again . 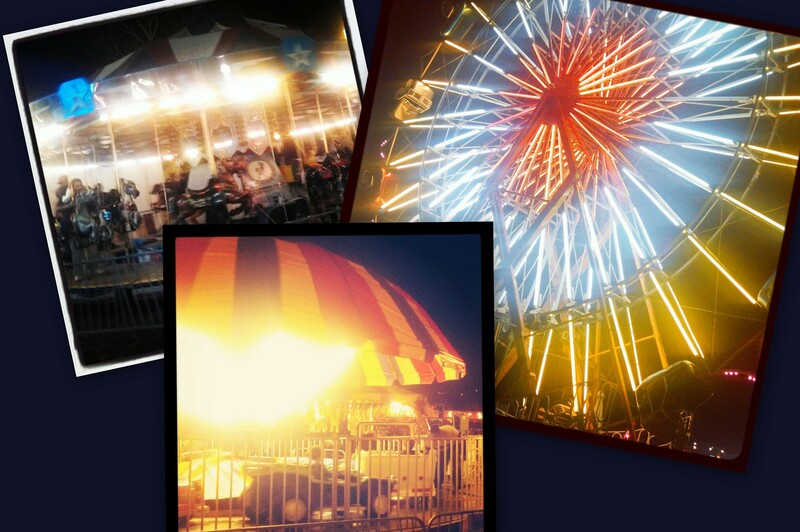 . .
Carnivals. The kind that set up in grassy, abandoned lots, and that moms never let us go to when we are little. 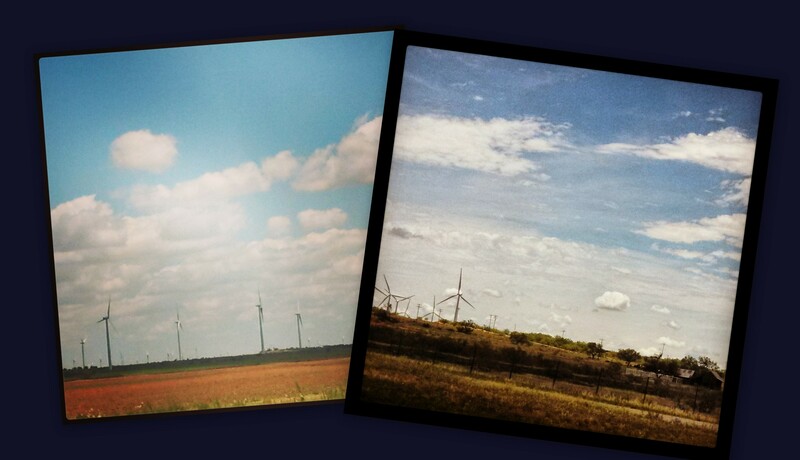 The kind that sways a bit in the breeze. They are amazing. I kicked my feet like a three-year old and was intensely glad that none of my students could see me. “Instagram”. I just discovered it, and the level of pretension inherent amuses me to no end. Alcoholic juicy-juice! Well, alcohol in a little box with a straw like juicy-juice. This is apparently common in Korea, and it is called “boxed sujo”. Why have I never been to this magical country? 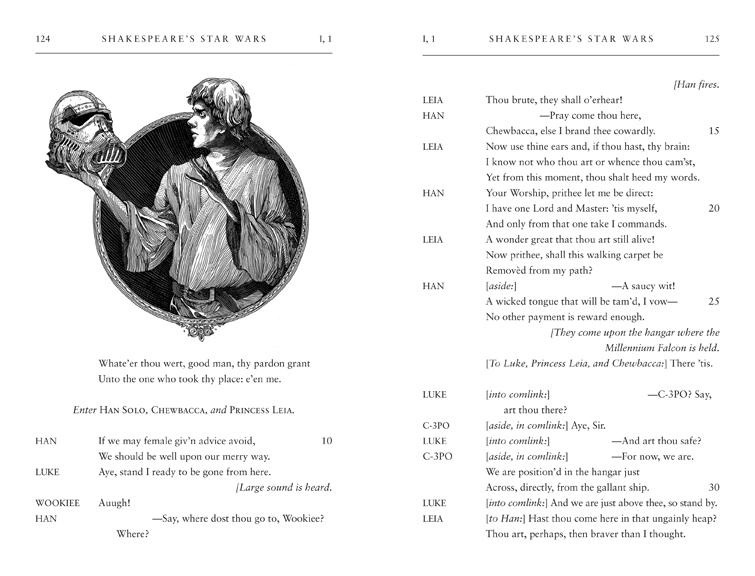 Star Wars, as it might have been written by Shakespeare. This is brought to us by the same people who did “Pride and Prejudice and Zombies”, so I reserve judgement. But the theory is the personification of awesomeness. As much as a theory can be a personification. Be quiet and go read the excerpt! 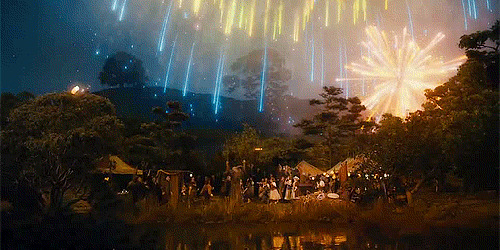 [This] day of July, 1776, will be a memorable epoch in the history of America. I am apt to believe that it will be celebrated by succeeding generations as the great Anniversary Festival. It ought to be commemorated, as the day of deliverance, by solemn acts of devotion to God Almighty. It ought to be solemnized with pomp, shows, games, sports, guns, bells, bonfires, and illuminations, from one end of the continent to the other, from this time forward forever. You may think me transported with enthusiasm; but I am not. I am well aware of the toil and blood and treasure that it will cost us to maintain this declaration and support and defend these States. Yet, through all the gloom, I can see the rays of light and glory; I can see that the end is more than worth all the means, and that posterity will triumph, although you and I may rue, which I hope we shall not. 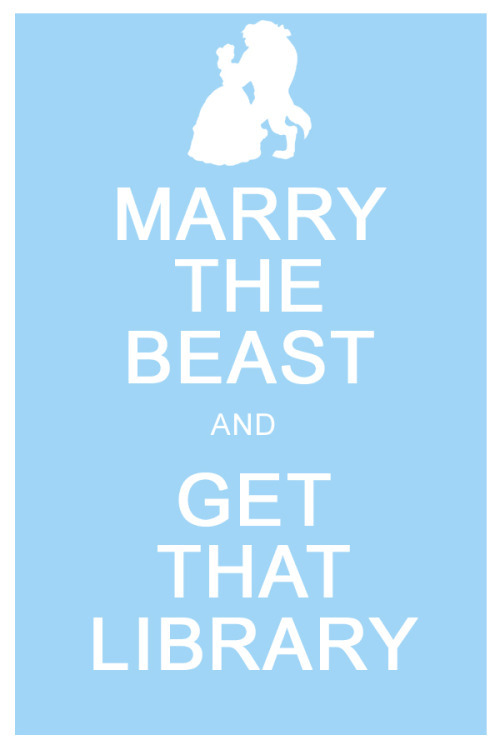 There is a meme making its way around the interwebs that declares, “I would marry the beast for his library!! !” Or something like that. There is even a facebook group for these brilliant and enterprising people. At first I was amused and pleased by this sentiment. A library is marvelous, magical, mysterious place, and I see nothing whatsoever wrong with marrying in order to get material possessions books. And then I remembered what this library looks like. 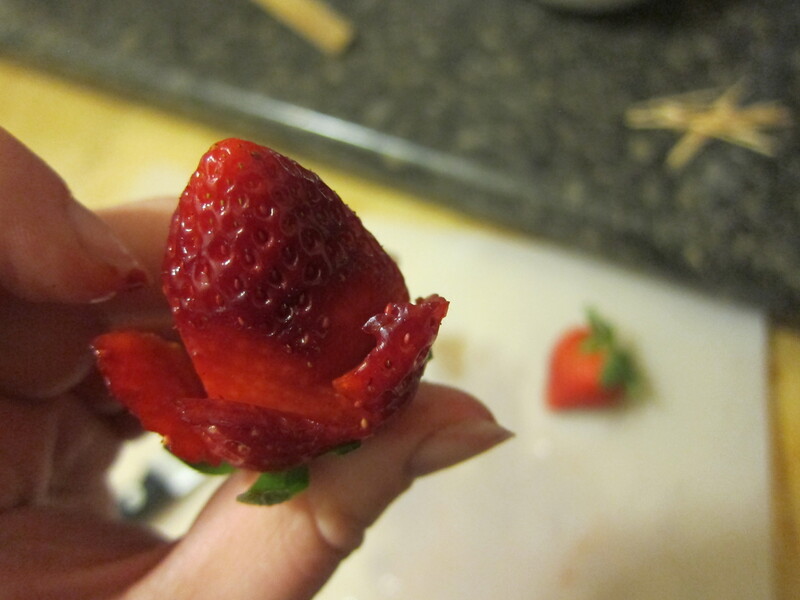 Oh, in theory it looks amazing. Millions of books, gracious curves, elegant stairs, long ladders, shiny marble, towering ceilings, etc. But where is the familiarity? the comfort? the ease of finding your book? I get the feeling that even the librarian (do we meet a librarian in the movie?) 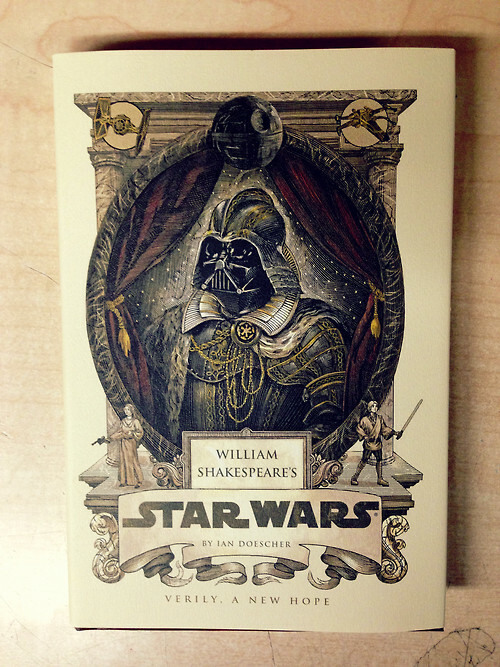 has a hard time finding a specific book. Do we need to establish architectural rules for what makes a good library? I think yes. So in reality, that library only has two attributes from list my for Good Library. Not a brilliant library, mind you, just a good library. Some system of organization, so that you have an idea of where to find the book you want. All books are within arm reach. I am not saying don’t have several floors or balconies (what do you call an indoor balcony?) but the ladders make things a tad ridiculous. Just add more walk ways! Many cozy corners, with seats and windows, or maybe a window seat! A friendly ceiling that does not threaten to echo every footstep or loom over you from such a cold distance. (Seriously, how did they keep that room warm in the winter?) High ceilings and open space is good, but not if it is overwhelming. Colors that put you at ease, so you actually want to spend time in the library. The atmosphere should be peaceful and relaxing, so you actually do spend time in the library. I realize that this rather vague. Also, it is hard to find all this in an existing library. Most public libraries pick one, maybe two, items from this list, and discard the rest. And the old renaissance libraries are worst! They must have been the inspiration for the Beast’s library, as they tend more towards the grand than the comfortable. Stiftsbibliothek, Admont Monastery Library, Austria. Would really want this in your house? Where would you read? That all as my caveat, here is my list for my future dream library. Everything from the Good Library List. Everything has organization, but it is okay if books get slightly out of order, or will not fit, or somehow mutiplyand suddenly you have books than bookcases and must start stacking on top of the neat lines of books. Wood. Lots of wood. Wooden floors, wooden shelves, wooden chairs. Everything from oak to mahogany to ebony to purpleheart. Because wood can feel cold, carpets. Possibly oriental carpets. And cushions on the chairs. More window seats. A few must have a little ledge that can also serve as a desk. A spiral staircase. Like in Henry Higgin’s library. A fireplace. Like in Henry Higgin’s library. More windows. So y ou get good reading light. And you can get some idea of what is going on in the outside world without needing to leave your seat. More books. You will find the room. And if you can’t, build more shelves! This is not hard. Books seem to breed; every time you turn around there are more! The Beast’s library is too huge, hard, and cold. I would not even know where to start looking through the books! The only public library that comes close (but lacks comfy seats!) is the Bodleian Library. In fact, I cannot find a photo of anything I would deem perfectly brilliant. But all of these below come pretty close. 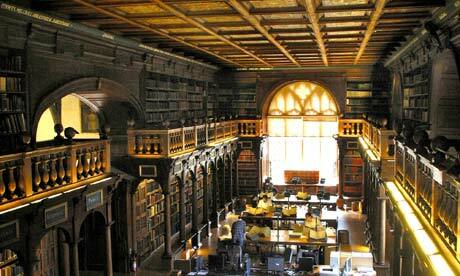 The Bodleian, Oxford. So pretty, AND friendly! Wood paneling and fluffy chairs. Yay! What is with those knick-knacks? Get rid of them, and get more books! Otherwise, perfect. Not quite comfortable, but the piano is brilliant idea! It needs more soft things! My dream library is in the body of an old lighthouse, carefully refurbished. The bottom floor would be the children’s books, comfy chairs, large desk, and fireplace area, and each landing up the hand carved wooden spiral staircase would have its own set of shelves and designation (poetry, lit crit, philosophy, etc.). The top, where the light would shine out, would be a 360 window seat, with very comfortable seats and an amazing view. As soon as I can figure out how to take photos of dream land, I will let you see it! What is your dream library? Do you have certain guidelines for what you need in a library? *Because saying “The Noun of the Noun” is so much better (read ” more pretentious”,) than saying “The Noun’s Noun”. I have often propounded – in writing and in conversation – the belief that art teaches us to see beauty. More, this is the main purpose of art. I have talked, quoted, referenced, scribbled, and thought. But I have not acted. So this video felt like a punch in the stomach. This is a fashion photographer who saw photo of disabilities and physical differences in medical textbooks, and was horrified by the ugliness portrayed. He instinctively recognized that those photos, that strangeness, does not show respect for the human person. In fact, most photos of say, down syndrome, make the condition look terrifying. And rather than just think about it, Rick Guidotti acted on it. He frames his work in terms of “thinking outside the box” and “redefining beauty”, but his work is much, much more. His enthusiasm and love and recognition of beauty are infectious: he sees the beauty of human life so clearly that makes it visible to everyone in his photos. He is an artist. I have always been under the impression that the fashion world makes the heart mind and soul small and closed. Silly prejudice. But Guidotti’s work made him better able to see the joy, life, and love that are the real components of beauty. He began with albinos, and since then has been photographing people with chromosome 18 syndrome, marfan syndrome, et al. This video cannot be imbedded but please click here to go watch! Thalia and I recently hunted for origami patterns of flowers, or similar objects, which would be manageable for someone who is not a paper-folding ninja, ie, us. 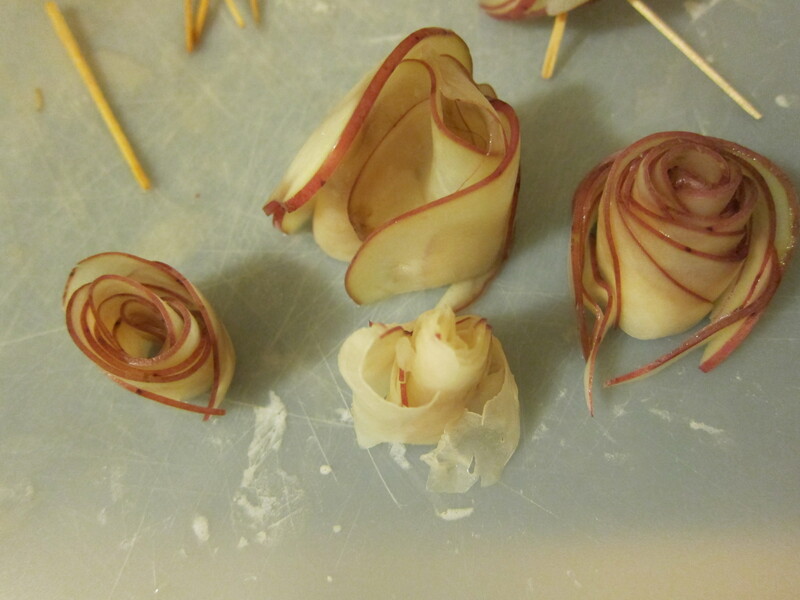 In the process, I found some projects which were not paper-based on this site. 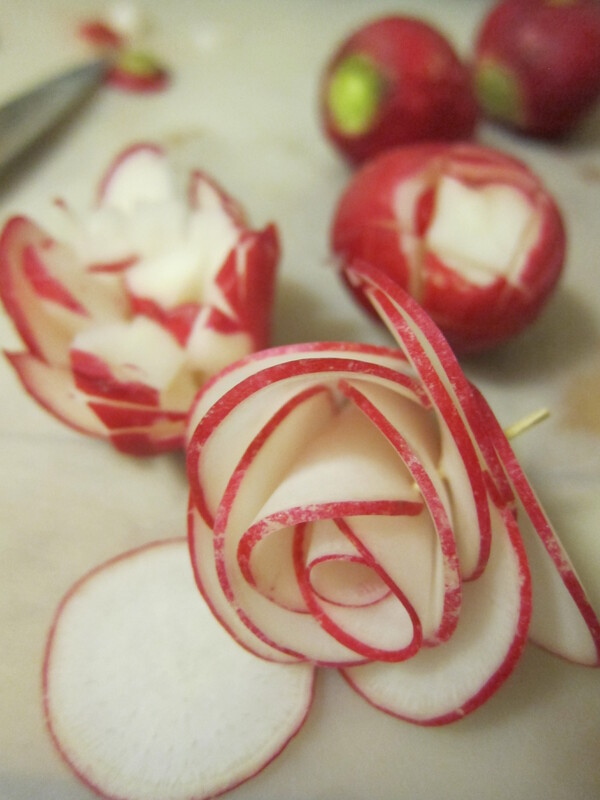 The administrator makes all manner of foods, including a bunch of different garnishes. 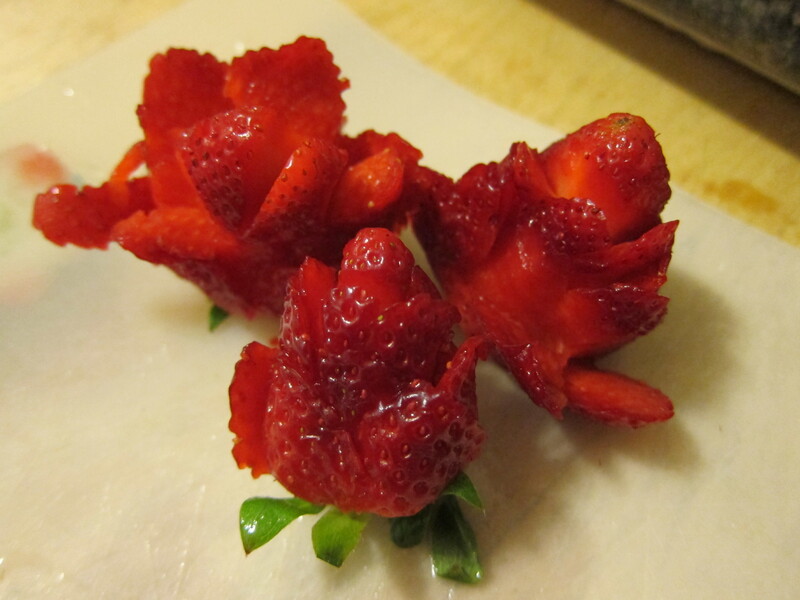 Annnnd somehow the process of looking at a bunch of roses made out of very thin slices of vegetables necessitated a trip to Meijer for to obtain an odd selection of produce. 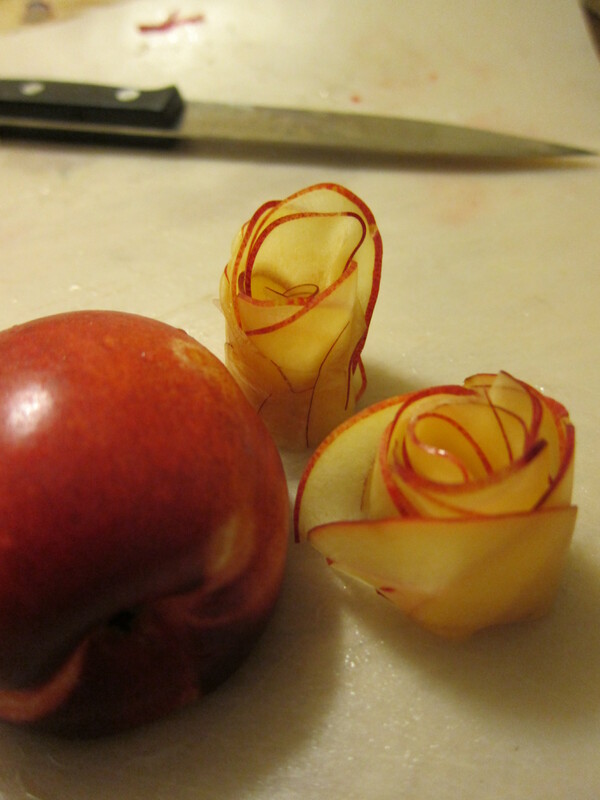 Once I knew I could make food roses with something besides bacon, how could you expect me to do anything else? 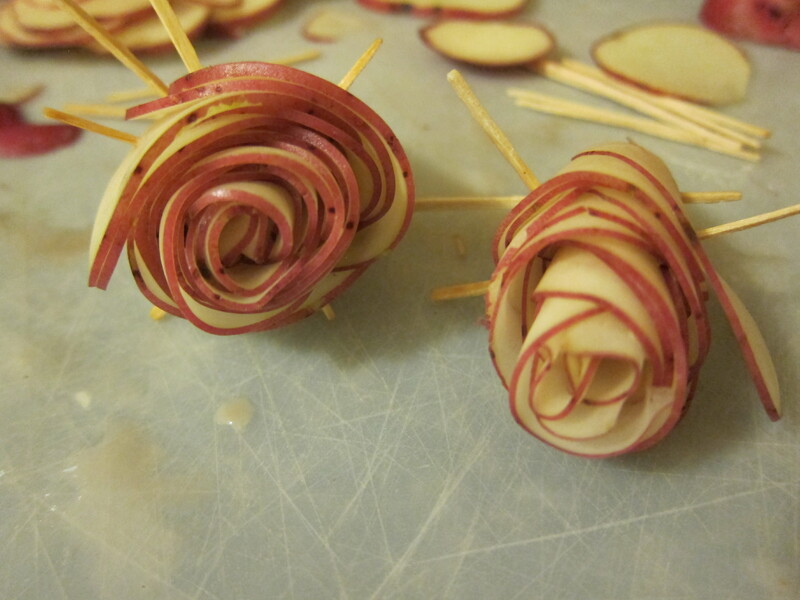 More or less any thinly-sliced food can be rolled into a rose shape. 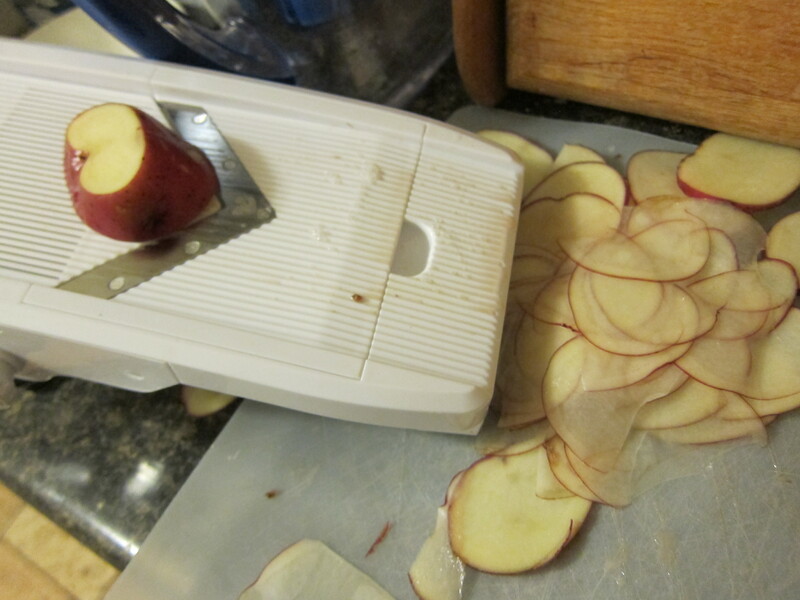 More or less any food CAN be sliced thinly if you have a mandolin handy, because that is, after all, the mandolin’s telos (which, of course, would be a Good Name For A Rock Band). 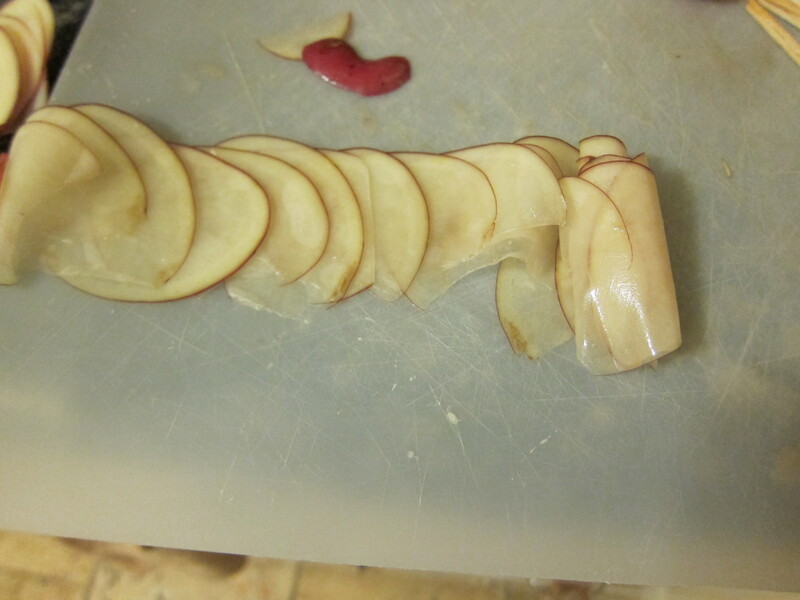 I tried it with a knife at first, but my slices were too thick as I have not trained at Le Courdon Bleu. 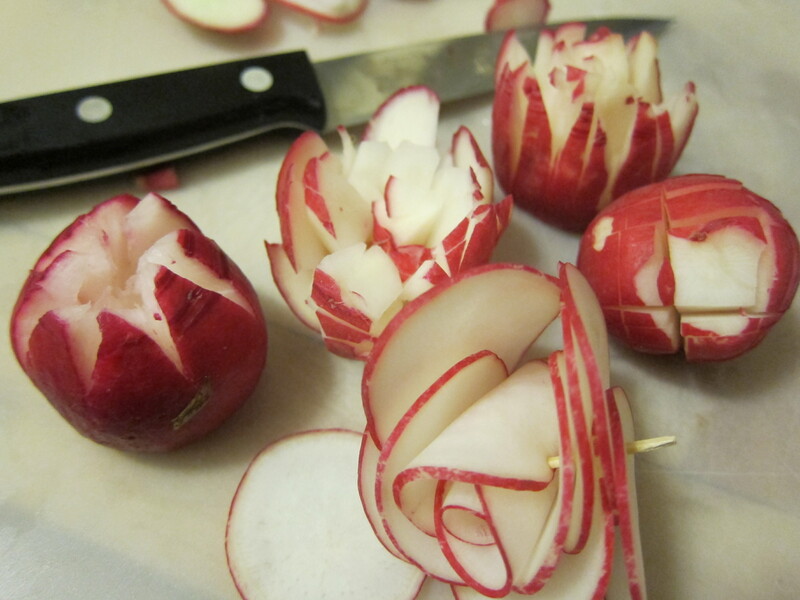 Fortunately, I’d acquired a mandolin in December for ratatouille purposes, and so gleefully spent an evening slicing away and rolling garnishes for a dinner I hadn’t made. PSA: Mandolins (of the bladed variety, not the stringed lute derivative) can and will destroy your fingertips given the chance. They will give you delicately thin slices of food but will endeavor to take your blood in so doing. Please exercise caution (and/or these gloves) lest the tip of your thumb come off; you’ll need that thumb if you ever want to start a rock band. I try not to blog about the stupidity that passes for entertainment in our culture. Not out of any desire to be virtuous or good, mind you. Just out of a darkly perverse refusal to grant the stupidity any more attention. I do same thing with anything that is really, really, REALLY popular. Things that are so popular that they could not possibly need or want my attention anyway. So I virtually ignore them. However, this does not prevent me from verbally ranting to my friends about such things. And one of my pet peeves is . . . . . song lyrics! Lyrics that are founded upon corrupt philosophical paradigms. Lyrics that are so dumb no musical brilliance can save them. Earlier this year I was certain that the lyrics to a Certain Overplayed Song were the Worst Lyric in the Universe. I’d catch a grenade for YAH. Throw my hand on a blade for YAH. I’d jump in front of a train for YAH. Leaving aside the fact that the music had a rang of about three notes, the lyrics are just fundamentally UNSOUND! Butthen, someone introduced me to Justine Bieber’s latest hit, “Boyfriend”.
. . . I . . . I . . . um . . . no words. No words can ever describe the idiocy of this . . . thing. It is not a song. It a collection of words and noted all jumbled together. I would accuse the kid of da-da-isms in both lyrical and musical attempts. But that that would be crediting him too much intelligence. You should not ever torture yourself with the song. So imagine my horror when I learned that my students, at the tender age of 10, adore Bieber. On second though, don’t inflict that on yourself. But then, Liam Neeson did dramatic reading of the . . . thing. Thankfully, the “music” is not included. And even Neeson’s Voice o’ Velvet cannot salvage the nonsense. Have a gander, and let me know what you think of the “lyrics” being fed our youth.